Just when it seemed Buffalo had begun to put its misery aside, the Bisons reverted to their losing ways. After preventing their losing streak from becoming the worst in the team’s modern era on Sunday, winning the finale of a four-game stint in Syracuse to halt a 10-game skid, the Bisons dropped both games of a Monday doubleheader against Rochester. The Herd is now 1-12 in its last 13 games and 35-42 overall. Despite returning to the friendly confines of Coca-Cola Field – Buffalo came into Monday with AAA’s sixth-best home record at 24-14 – the Bisons couldn’t continue their climb from the depths of the International League North Division on home grass, falling 4-3 and 4-2 to the Red Wings. "Right now we're struggling in the win department," Bisons manager Bobby Meacham said. "...We're just coming up a little bit short. One hit short, one pitch short, and hopefully we can turn this around." The Bisons’ 10 losses from June 16-24 tied their longest losing streak in the team’s modern era, matching the 1994 squad’s 10-game skid to end the season. That year, the Herd dropped 28 of its last 37 games, finished 55-89 and shortly thereafter dumped the Pittsburgh Pirates as its major league affiliate in favor of the Cleveland Indians. Before this year’s team could unflatteringly top that streak, it narrowly snatched the series finale at Syracuse on Sunday after a three-run ninth inning, 7-5, to avoid being on the wrong end of a third consecutive sweep. The win rescued Buffalo from finishing a combined 0-7 on its road trips to Rochester and Syracuse. Still, the Herd recorded only its seventh stretch of eight or more consecutive losses since 1985. During the 10-game slide, opponents outscored Buffalo, 49-19. The Bisons didn’t score for three straight games from June 17-19. And to bury the nail in the coffin even further this past weekend in Syracuse, the worst team in all of AAA won the first three games of the series each by one run, two victories coming on walkoffs. "For me, it's just one little break for somebody," Meacham said. "...beginning of the season we were getting that extra hit, we were getting that extra pitch and picking up wins and walking out kinda going, 'Wow, I can't believe we came back again.' We gotta do the same things now. "Now that we're piling up some losses, we gotta keep doing the same exact things and hopefully it'll turn and we'll get some wins." As a consolation prize at NBT Bank Stadium on Sunday, the Bisons’ record away from home improved to a still paltry 11-26. Buffalo owned the biggest disparity between home and away records in all of AAA entering Monday, and its most recent misfortunes on the road dropped it to fifth place, above only Syracuse, in the International League North Division standings. Yet just when it looked like Buffalo might be turning things around upon its return west, a Rochester team that came in having won nine of its last 10 continued its hot streak and improved to 11-1 in its last 12 games while Buffalo fell deeper toward the division cellar. 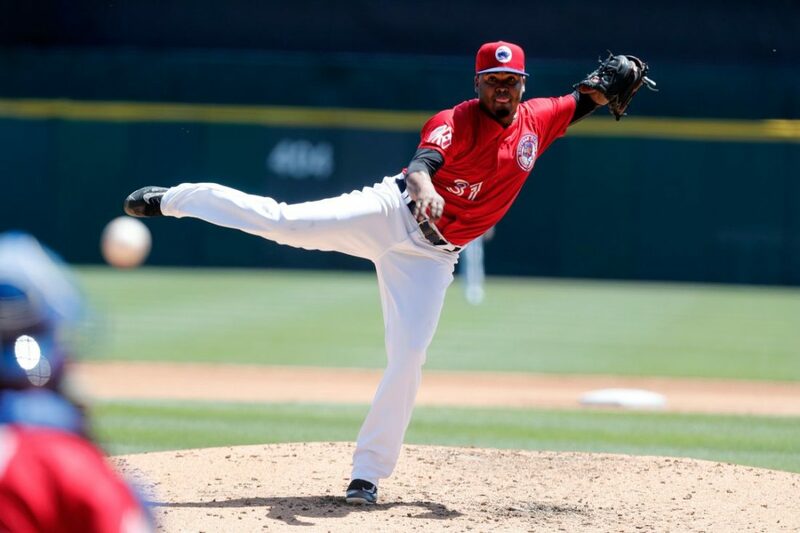 In Game 1 at Coca-Cola Field, Niko Goodrum's sixth-inning RBI double put the Red Wings up 4-3, erasing a once-three-run Herd lead. In Game 2, it took only 2 1/3 innings for Rochester to score four, when Leonardo Reginatto blasted a two-run homer into the netting beyond the left-field wall to put the visitors up, 4-1. Not even a return home could bring the Bisons back to life for more than one game, inconsistent hitting and pitching dooming the hosts in their latest falls. From four games over .500 to seven games under in just 11 days, the Bisons are still searching for answers on how to right the ship. "It'll happen," Meacham said. "It's just a matter of when."